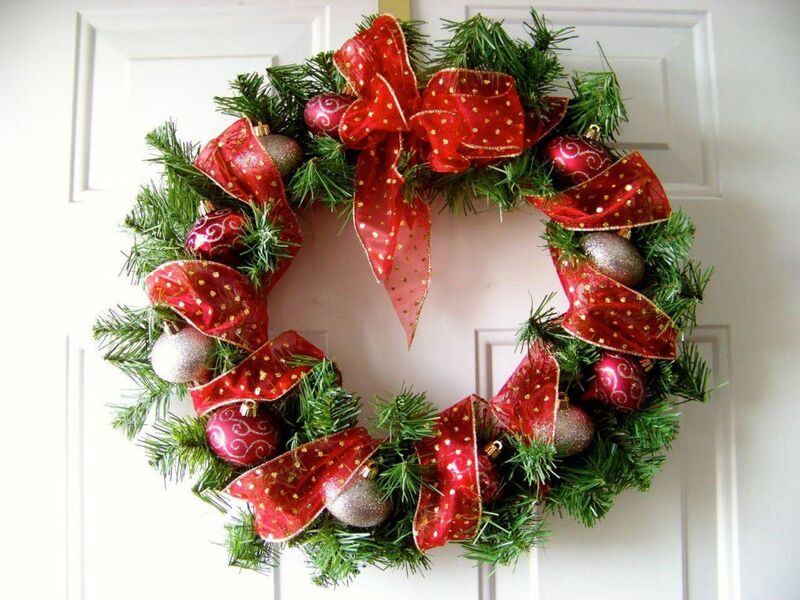 To decorate your house in an original way, you can make a Christmas wreath on a door with your own hands. For this purpose, a variety of materials from natural plants to artificial objects and products, which are suitable for human consumption, are used. The final look of a product depends only on the imagination of a master. 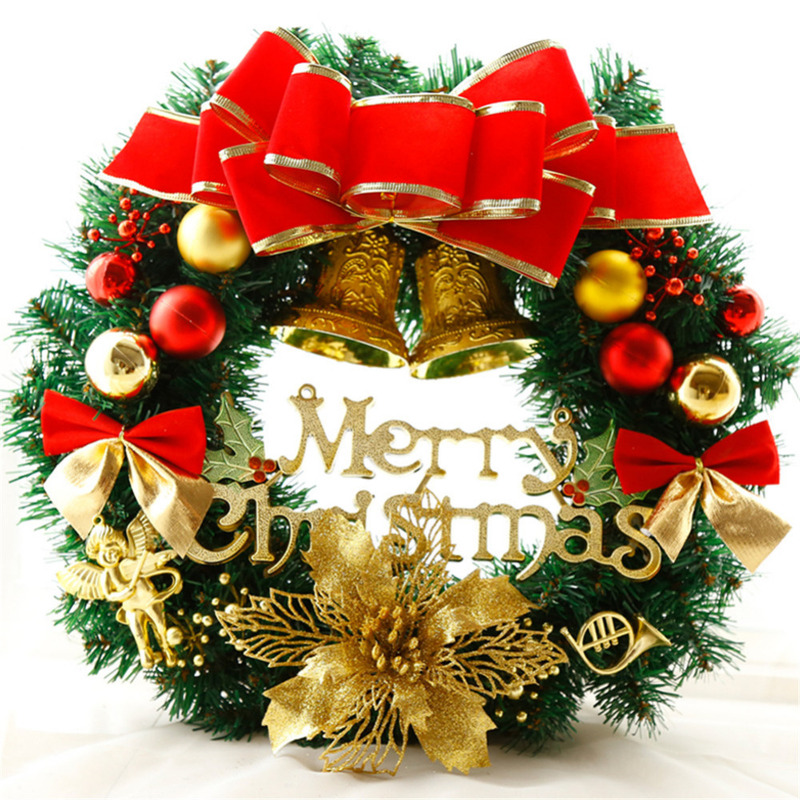 If you want to give a festive atmosphere to your house that will shroud you from a doorway, there is nothing better than to attach a Christmas wreath to a Christmas door. Such decoration has long been considered as a symbol of a holiday season. It symbolizes infinity, prosperity and expectation of Christ's birth. Wreaths on a door, made with your own hands, have special energy. 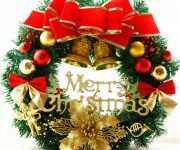 This Christmas decor characterizes also by the features of a character and domestic way of life of its owners. 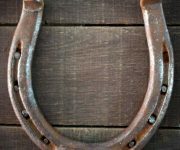 It is possible to put a powerful positive emotions. 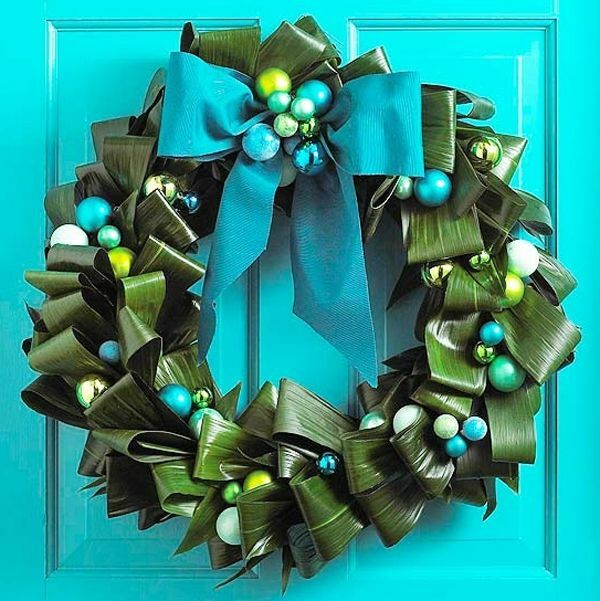 To decorate a door with a wreath made with your own hands, you can use different products. As a basis you can a ring of cardboard, hose, wire, twigs and so on. Note: a size and weight of the wreath should suit a way of attachment. Think carefully about that. 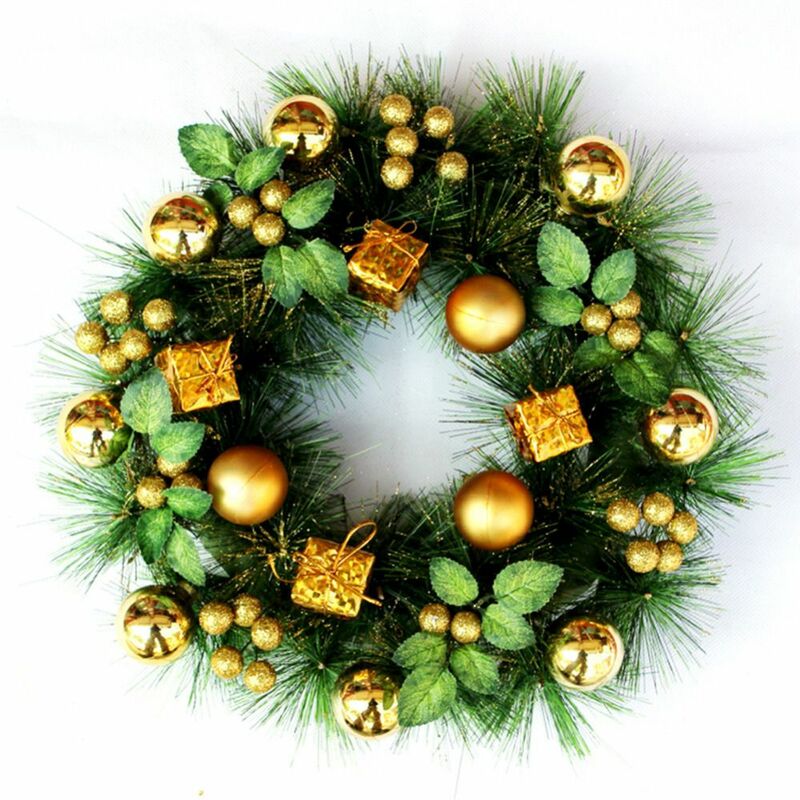 Usually a wreath on a door contains pine sprigs. Make this option with your own hands is quite simple. This will require branches, wire, and additional decorations. Firstly, do a foundation. For example, cut out a cardboard ring by width of about 10 cm. Begin to shape our Christmas wreath. To do this, fasten separate branches with a wire so as to completely cover a foundation. Additionally use a hot melt adhesive. Next you need to fasten decorations over green branches. For example, use strobile, small Christmas toys, bows. The most convenient way is to fix them using the same wire. 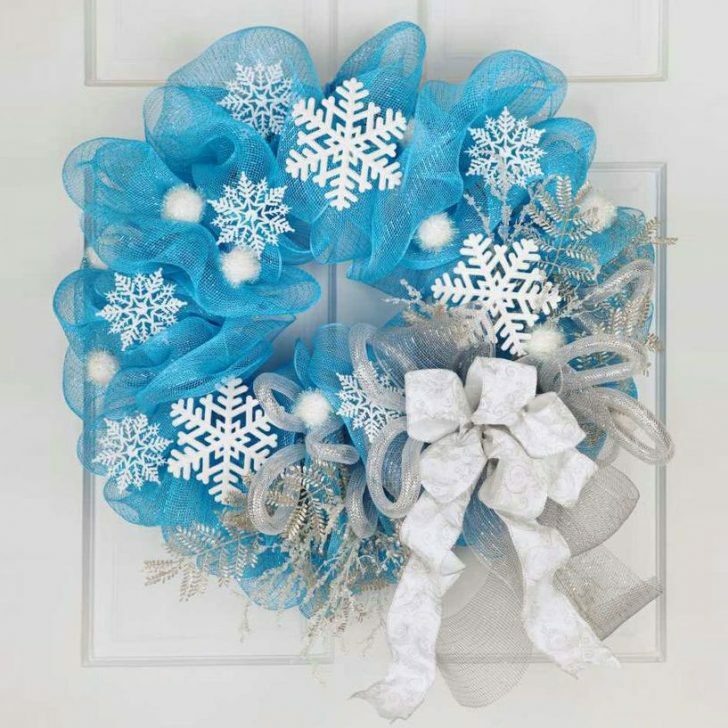 You can tie a decorative ribbon or wreath to weave electric garland with small bulbs. On the top sprinkle a product with artificial snow, glitters or gold paint. A Christmas wreath of dried twigs can be an alternative. It looks no less impressive than its evergreen variation. To make it with your own hands it is not necessarily to use foundation. Take a bunch of bars and twist them, so that interwoven branches form a perfect circle. Fasten them together. Between sticks fix strobile, berries of rosehip, juniper, and so on with wire. You can use the inflorescences of Physalis and other dried flowers. The most spectacular are Lunaria, Helichrysum, panikum, feverweed, stonecrop and similar plants. In addition, you can sprinkle a wreath by paint, for example, silver or gold. A Christmas wreath can consist of food. 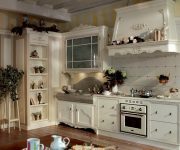 The main condition of this method of decoration is that all the elements must be processed not to spoil. 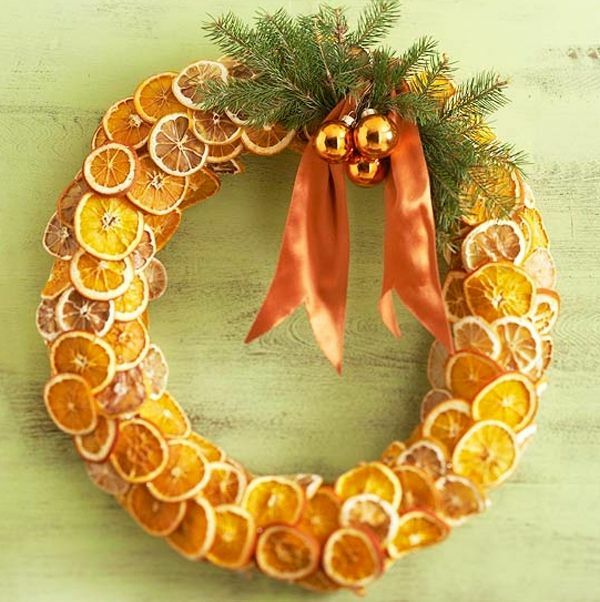 To create a wreath dried oranges rings, lemons, various dried fruits, nuts, beans, spices and so on are used. Prepare a base. A folded newspaper can be used. Close a circle by cloth, colored paper, or bars. Proceed to the decoration. The easiest way is to fix food on the glue with a pistol. Use dried citrus, colorful beans, pasta of unusual shapes, stars of anise and cinnamon sticks, walnuts or peanuts in the shell. 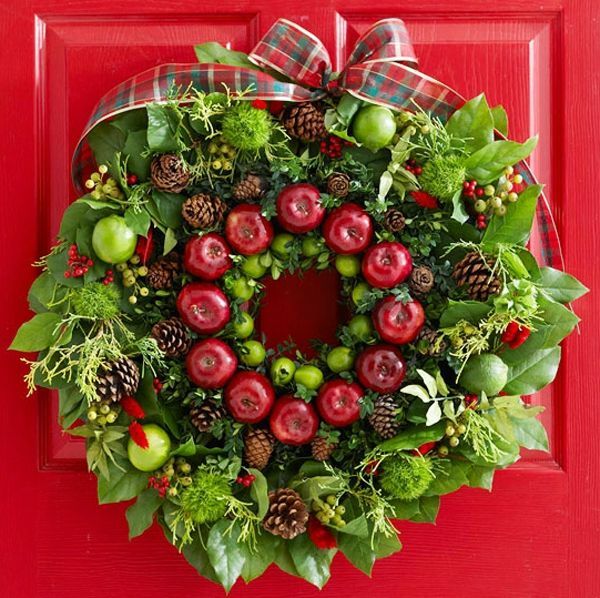 The great advantage of such wreath is as soon as you open a door of an apartment you will immediately smell the pleasant aroma of citrus and spice. This New Year's decor brings a double benefit; it is a natural air freshener. 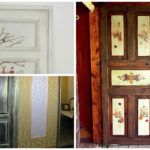 After the end of the winter festivities it can be used as decoration for the furniture and put in closet with clothes. How else can you make a Christmas wreath on a door with your own hands? Use a cloth. For example, make a Christmas wreath made of scraps and old clothes. There are many ways of modeling. Plaits can be sewed of patches, filled with synthetic padding and braided in the manner of pigtails in a circle. You can follow the technique of patchwork and attach small pieces of different material to the base. Additionally, use thread and decorative cords. 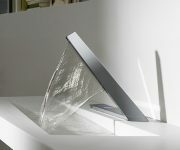 The same effect can be obtained using ribbons. A wreath looks festive, if it is fully created from ribbons. Make a base from cloth and soft filling. Cut mesh of different stiffness and colors into small squares. Grab a center of a square by a needle and thread and slightly gather a cloth. 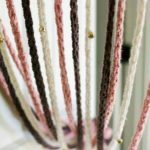 Sew a piece to the base and stitch an entire circumference of the hoop. Decorate a product by beads on a wire. A Christmas wreath can be made from simple materials: paper and foil. The great advantage of this product, in addition to ease of work, is the fact that it can be hung on a door, even with the help of adhesive, because a wreath is very light. You can cut out snowflakes from paper and glue them in a circle on a base. Alternatively, roll colored pieces in the form of cone and form an unusual composition. 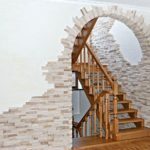 There is now a popular technique of quilling. You can even use bows for gift decoration. Roll colored foil balls of different diameters. Glue them onto a base. Sprinkle a wreath by glitters. Add bows and Christmas decorations to the composition. 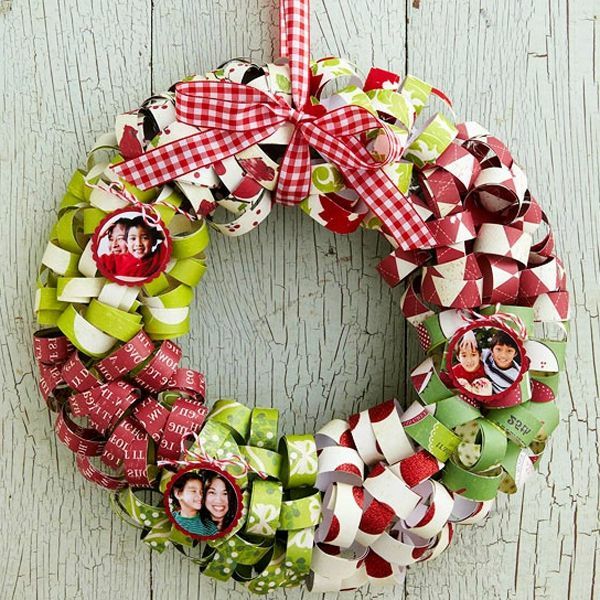 A Christmas wreath can be made even from simple Christmas toys. Choose balls in different colors and diameters. 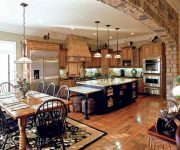 Cover a basis by soft material, you can use tinsel. Attach a ball with a wire or thread, passing it through a top. Complete a product by bows and ribbons. A Christmas wreath can be created with your own hands using ordinary chocolates. To dilute the sweet goodies, use the flowers. It can be dried flowers, evergreens, fabric flowers, candy wrappers, etc. A great option is dried semolina inflorescences prepared in summer or red Poinsetii leaves. Firstly, you need to attach candies by glue, wire or threads. Complete the composition by floral insertions. A handmade Christmas decoration must be installed to its appropriate place. 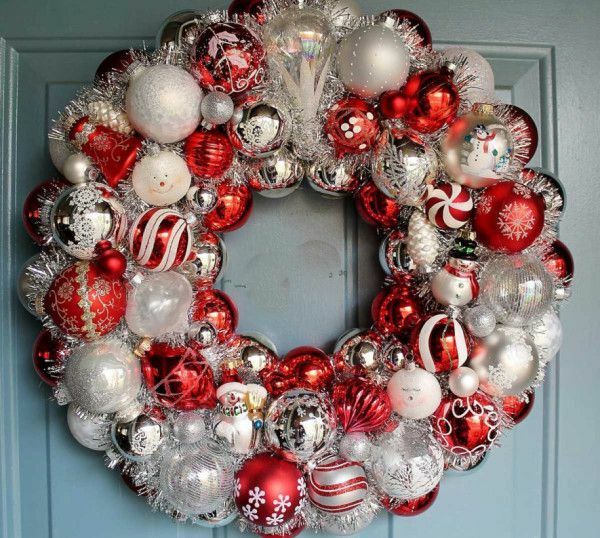 How to attach a Christmas wreath on a door? There are several ways. If a product is pretty light, you can try to attach it with tape or put on double-sided adhesive tape. Another option is with the help of a thread to catch it with a peephole. In any case, such techniques are not very reliable. 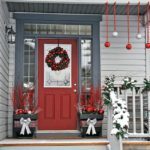 How to hang a Christmas wreath on a iron door? In this case, perhaps the only way is a hook on glue, like those which fasten in a bathroom, or on a suction cup. The first option is much more reliable, but it can leave trails and you will have to wash it. 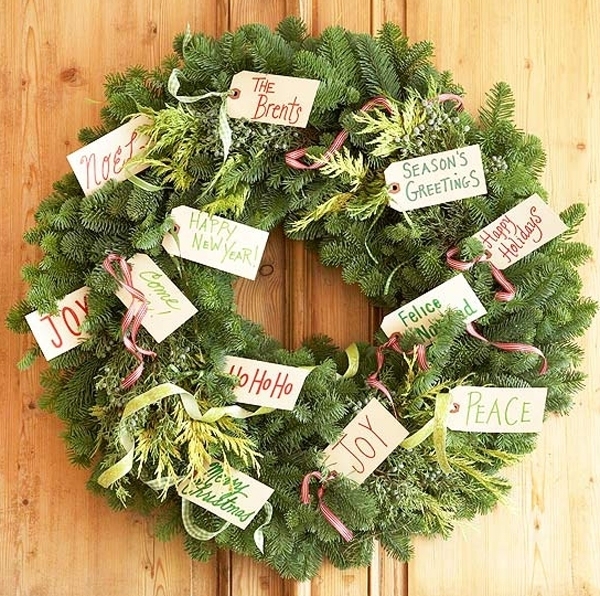 Look around, you have something from which you can make a beautiful Christmas wreath with your own hands. Feel free to get down to business and do not be afraid to experiment.